Face it, we all know that Mommies need a vacation. Whether you are a SAHM, WOHM or anything in between, you probably aren’t getting enough relaxation. But how can you relax when you can’t leave your kids behind? If you can leave your kids behind, how can you stop worrying about them long enough to relax? 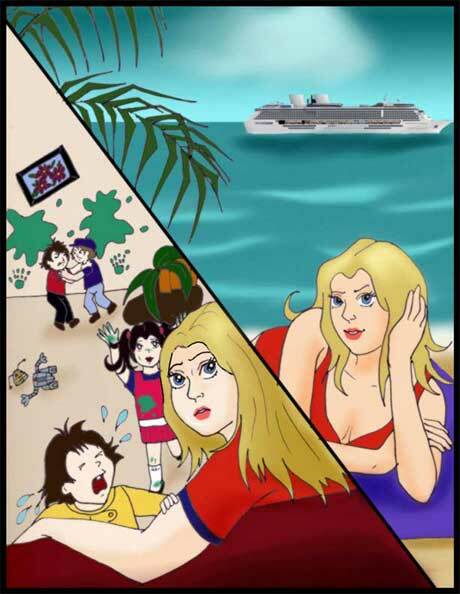 The obvious solution is a family vacation, but as we all know that can end up more stressful than our everyday lives! So where can you find a family vacation that is also relaxing? Cruising has been growing in popularity over the last few years, especially with families. The major cruise lines have been building bigger and bigger ships and adding more and more attractions. Cruises depart from all major US coastal areas, and around the world as well. But cruises can be fun for everyone, not just the kids. The purpose of Mommy Cruises is to provide information to Mommies. Of course you care if your kids have a good time, but we are most interested in your good time. Look around at the information provided here. We hope it is useful and inspires you to take a relaxing vacation soon. Why is a Cruise Relaxing? Picture this: you are staying at a luxury hotel where your linens are changed twice daily. You never have to cook food because restaurant-quality meals are prepared for you three or more times a day. Multiple pools and jacuzzis are open for a soak or swim. There are many pleasant corners to curl up with a good book or play a game. A spa is open for relaxing massages or manicures. The view is incredible, and itchanges daily. Every morning you wake up in a new place full of things to explore. Every night you sit down to a 5-course meal where every dish you desire is whisked to your table by a team of waiters. Afterward you can see a Broadway-style show or concert, dance to many different music styles or take a romantic walk under the stars. Your kids will be with you some of the time, but they will also be on their own. There is a dedicated kids club with experienced counselors who lead activities and games and allow your kids to play with others their own age. Whenever you want to do something your kids think is dull they have their own place to go and something fun to do. A cruise is relaxing because it allows everyone in the family to do what they want, while still meeting together during the day. Most major expenses are included and activities are designed for all age groups. It is a way to have romance and family fun all in one package. And this is true regardless of where your cruise takes you. Click here to learn how to get the most out of your vacation with kids. We are a married couple with two children. While we became addicted to cruising on our honeymoon, we are now dedicated to cruising with kids. We have cruised pregnant and with our children and hope we can help you take a cruise too!